Things have actually gone very well, although there have been a few issues, such as a very unpleasant and rather frightening drugs interaction, which I will discuss later. Some swelling as to be expected; but minimal signs of bleeding which confirms that my immediate first aid measures worked. Refer to my earlier article here. Bleeding into tissue, dead cells and swelling all compromise healing, so the less - the better for there to be a quick and uncomplicated recovery. Excellent wound healing. No excess inflammation at all. I have been taking special supplements to help regulate inflammation and to help the body dissolve and excrete dead tissue and blood clots. These need to be removed before healing can happen in earnest. but not too much detritus to worry about. 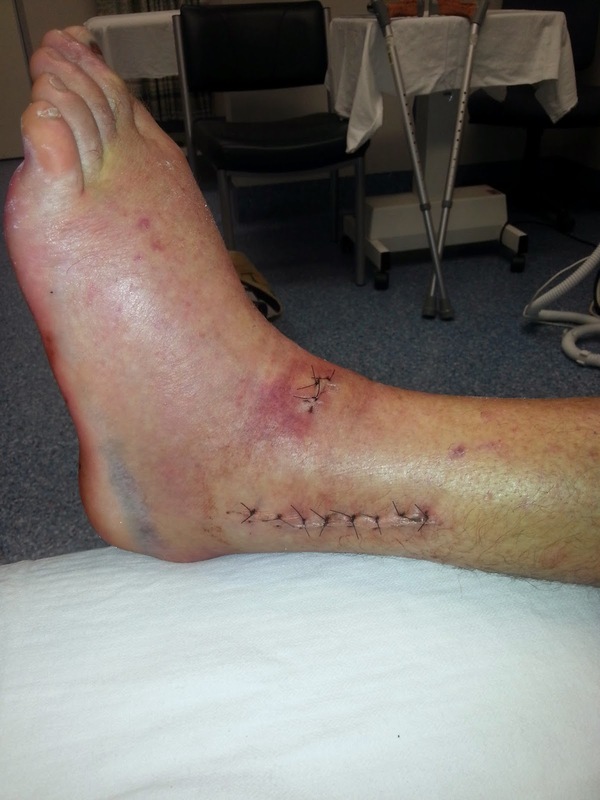 I've seen worse looking ankle sprains, so I'm delighted with how things are looking. Not pretty; but I am delighted that there is some promising movement in the joints: A little plantar flexion, dorsiflexion, pronation and supination. I'm off to a good start! Enough of that - its back into plaster for that leg. When joints, bones and soft tissue are violently disrupted, such as happened to my left foot, blood vessels are ruptured (thankfully only capillaries, low pressure veins and not high pressure arteries). If this is not bad enough the trauma is compounded by the hours of surgery to realign the broken bones and displaced joints. This involves quite a lot of hacking, wrenching and screwing which is all additional trauma. Blood continues to be pumped to the foot (thankfully! ); however, the blood flow back to the heart is compromised due to the damage to the peripheral veins and capillaries. 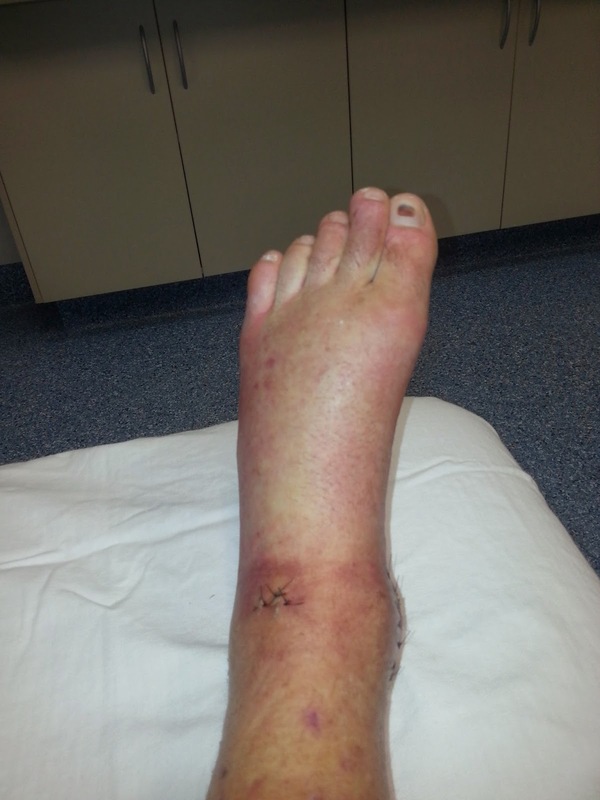 Similar damage has been done to the tiny lymphatic drainage vessels and this will be seen as swelling of the foot. Being immobilised in a cast makes the circulation problem worse because the muscle pump effect of muscular contraction and relaxation is no longer available to pump blood and lymph fluid back to the heart. The consequence is the foot will go purple and blow up like a balloon if it is not constantly elevated. Constant fatigue, swelling and throbbing of the foot have been the main problems I have been having to deal with and I have found it most unpleasant and requires constant lying down, now causing an unpleasant rash on my lower back. If you visualise the extent of the damage done to the bone and soft tissues around the narrow collar of my ankle, you'll appreciate just how badly the circulation through my foot has been compromised. How much? 10%? 20%? I have no idea other than to say that it feels like a whole lot! This means regrowing a whole lot of tiny blood vessels. I am helping this along by taking a mix of supplements that enhance circulation, support tissue healing, break down dead tissue, including fibrin and support liver and kidney with handling the toxic load. Leg elevated: dark, deoxygenated venous blood drains out of the leg quite quickly and the feeling of pressure is relieved. 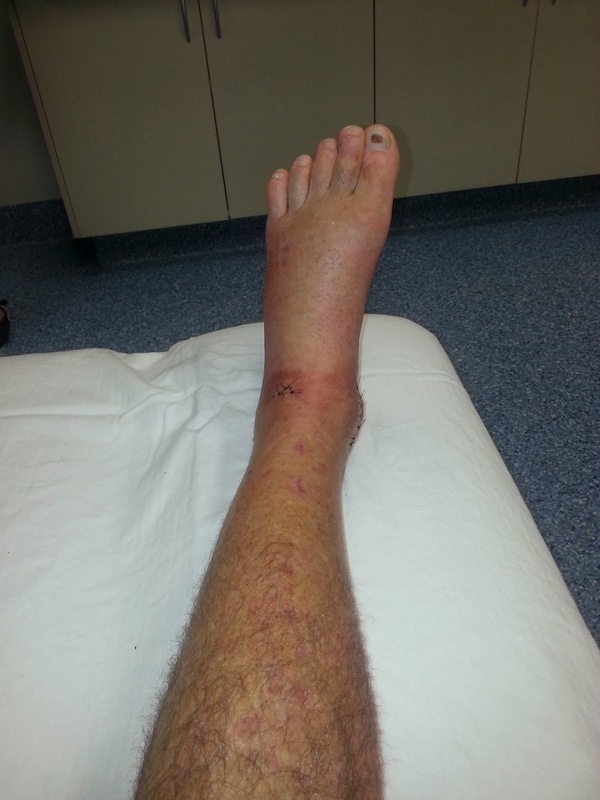 I have been reluctant to take much in the way of pain medication. This is because I need some pain feedback to tell me when to change position and when to raise my leg. Pain is your friend unless it becomes so intense as to cause suffering and debilitation. The two pain medications that I have been taking is Tramadol and paracetamol. Initially this was at the minimal rate of just one of each in the morning and the same again at bedtime. By Day Ten I had reduced this to one of each at bedtime only. The problem with these drugs is they are tough on the liver and kidneys and I need these organs to be working at 100% to clear the dead tissue from my body without compromise. Paracetamol has a number of serious complications, including asthma, skin reactions and liver failure. Tramadol is a narcotic-like drug and can be highly addictive. It is also toxic to the liver and kidneys. So, while I have been taking some up till now, it is very little only as much as is needed to make life bearable. As of today, I do not think I will need any more drugs from now on for pain management or sleep. I have also been soaking in a large, hot bath with a handful or two of Epsom Salts in the water to help relax the muscles. The bath brings about profuse sweating like in a sauna. Sweating is an effective way of ridding the body of metabolic toxins, while bypassing the liver and kidney. Its easy to prop the cast on the side of the tub and getting out is a good workout for the upper body. The most effective pain management is elevation which I am having to maintain constantly for now. This has worked quite well and I am noticing improvements each day, although the warm nights have made sleeping comfortable almost impossible with a heavy, sweaty cast on my leg. In fact, I have been so restless at night it has been almost to the point of despair. Last night I seriously thought of cutting the cast off. I so want to move my ankle. But that will have to wait another four weeks. I am so over it! Two nights ago my partner, Alofa, arrived home later than usual from doing the weekly groceries. She had purchased half a dozen craft beer and handed me a bottle which I enjoyed very much. About an hour later I went to bed, thinking nothing of as I swallowed a Tramadol capsule. About half an hour all hell broke loose: I began to twitch and fidget uncontrollably, scratching my scalp face and body. My body was burning hot and I was becoming almost uncontrollably anxious. My pulse was raised about 20 beats above rest. I figured I was having a reaction to the combination of Tramadol and alcohol, although both were small amounts. I hopped to my office where I hooked up my blood pressure, pulse and temperature equipment and waited. Squirming and scratching. It did occur to me that I would have to get the ambulance if things got any worse! However, my vital signs were okay, so I resolved to wait it out. By about 1.30pm I was beginning to settle and was able to return to bed shortly after for the reminder of what was a less than pleasant night. Although I was aware of the danger of mixing narcotics with alcohol, including convulsions and death, I got well and truly caught out. Brain fade. The lessons I have taken from this distressing brush with drugs interactions is to be extremely vigilant by keeping the brain in gear at all times and that it is best not to take any drugs, or the least possible. Its just far too easy to make a mistake. In my case, I am so thankful that I took only one Tramadol and not 2, 3 or 4! Two weeks have passed and all I still feel like doing is lying back, dozing off and sleeping. This is because I need to. There has been a huge amount of damage to my leg - twice, if you think of it - once from the accident itself and then a second insult from what added up to almost half a day of surgery. Over the ensuing days and weeks, toxins are flooding into the circulation where the liver then works like a huge filter to pull them out, neutralise their toxicity and then excrete the end products through the kidneys and the bile. The initial toxic load is from a mix of medications and the contents of cells that were destroyed during the accident and surgery or shortly thereafter. Clotted blood that fills the injury site must be dissolved and removed from the injury site for healing to happen. Tissue that survived the initial insults of injury and surgery may be stressed and die from the combination of being surrounded by toxic dead cells and their contents, smothered by congealed blood and poor oxygenation due to blood vessel damage. Much of this secondary damage can be avoided by flooding the body with a mix of powerful anti-oxidants and ensuring that there is minimal pooling of blood and swelling. I have had these measures in place from the very beginning and they are working well, by the way. The end result of this toxic overload is fatigue, fatigue, fatigue - and bad breath! I feel similar to a person who has hepatitis, Tapanui Flu, glandular fever or post-viral fatigue syndrome. The management of these is to focus on supporting enhancing liver function with a mix of various herbs and supplements such as milk thistle, lipoic acid, a multi mineral salt and even good old vitamin C! Sweating daily and drinking plenty of fluid are also most beneficial. Most important is my body is telling me to rest. I am tired and for good reasons that are not to be ignored or circumvented. Sure, I would like to get exercising and back to work today but I would be foolish to do so. My body needs rest for the time-being and that is what I am doing. 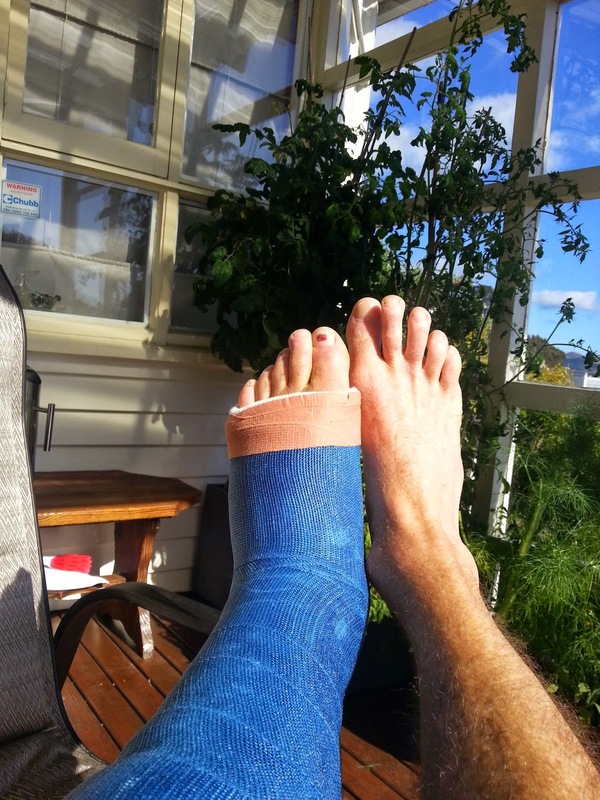 Exercise and working are tiring and keeping the leg elevated all the time is impossible, so healing and recovery will be compromised and may delay a full return to work and sport. I know I have a tough job ahead of me to regain full function of my left foot. I agree with the surgeon that arthritis is a high possibility, given the extent of the damage. I do want to resume my quest to win the world mountain bike champs in 2016 and I do want to go for some age group running events later. For this to happen, patient rehabilitation is the name of the game. Patience is the key! 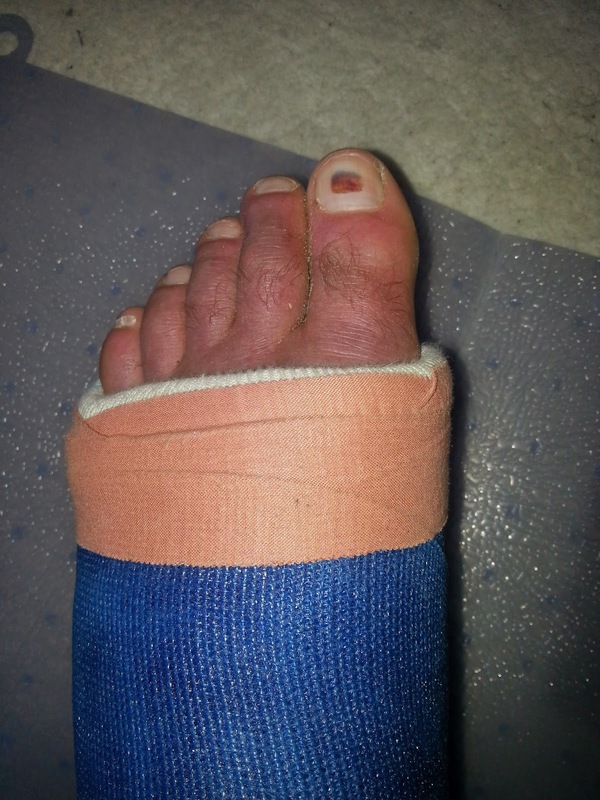 My next article will deal with resuming exercise gradually and safely while still hobbled in plaster. I am just about ready to go.